The aftermath of the rescue spread the name of Grace Darling throughout the land and then beyond these shores. The Press of the day were soon on the spot, and reporters knew they had a great story. The news-sheets spread the word nationwide. Newspapers from overseas reporting on the great story of the Forfarshire and the rescue ensured her fame was now worldwide. Grace received prompt recognition for her brave and courageous action. She was being called a heroine. Artists came to Longstone to paint her portrait. There was great interest in what this young woman looked like. With photography still in its infancy, paintings were copied by engraving and printing, and were sold to an eager public. There was great demand for images of Grace Darling, heroine of the Farne Islands. Letters by the hundreds began to arrive from admirers. Presents and fine items came to Longstone as gifts. 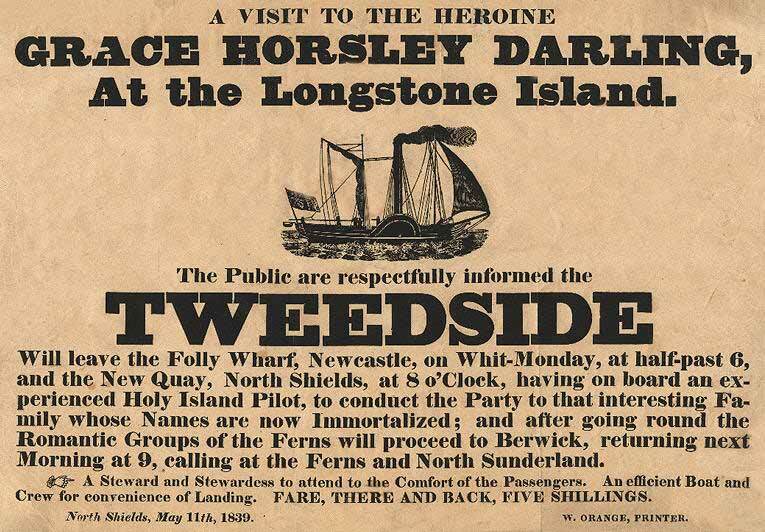 Money was sent: Visitors arrived by boat hoping to catch a glimpse of Grace Darling, heroine. Another suggestion was submitted that she should be “brought out in proper style in London as an exhibition”, as if she were some strange beast. Grace rejected such invitations, insisting that the rescue was not down to her actions, but to the power of God. Similar invitations were also made by other Theatres around the country including one from Drury Lane in London. The moving panorama was a forerunner of the cinema. It consisted of huge reels of painted canvas, measuring hundreds of feet in length, depicting various scenes. This would be unwound by concealed machinery in front of a seated theatre audience, with a narrator describing the different scenes. A wreck at sea and a rescue was ideal subject matter for a panorama and portrayals of the Forfarshire rescue were created by several artists, including some of the painters known to the Darlings, Henry Perlee Parker and Robert Watson. Watson’s panorama was on a grand scale and opened on Boxing Day 1838 at the Sunderland Theatre. Watson engaged Daniel Donovan, a surviving passenger on the Forfarshire to present the show and narrate the story, giving a first hand account. There was musical accompaniment, portraits of the Darling family were on show and David Dunbar’s busts were positioned on each side of the stage. “I would like for Grace and you to see this panorama of mine which has cost me some nights’ and mornings’ work. You would be worth a whole theatre of others.” wrote Watson, optimistically. The Darlings did not attend. Watson and Donovan also took the show to Hull; it was from Hull that the Forfarshire had set out. That same month two inventors of life-saving equipment promoted a panorama at the Egyptian Hall, Piccadilly, London. 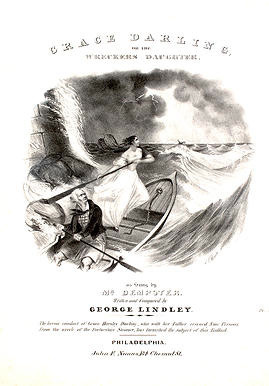 Along with a genuine desire to pay tribute to Grace’s deed, Captain George Manby and Mr John Dennett also used the production to publicise their inventions, an early example of Grace Darling’s name endorsing a product. An elaborately-produced panorama was shown four times a day. William McGonagall’s poetic effort, ‘Grace Darling, or The Wreck Of The Forfarshire’ (1887) is best forgotten! 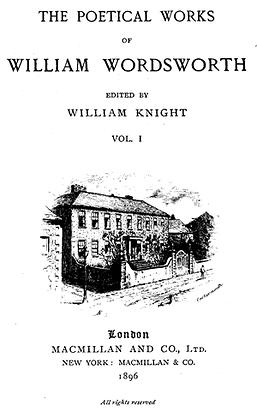 Romantic poems were one thing; fully written novels were another. Their storylines bore little resemblance to the truth. 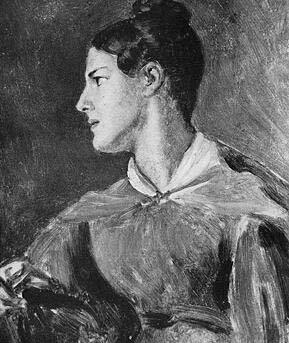 G M Reynolds, the founder of Reynolds News, published a novel in 1839: Grace Darling; or, the Heroine of the Fern Islands. It is full of subplots unconnected to the Darlings, which merge into a fanciful ending involving all the previous characters in the book. Songs and broadside ballads were composed with wildly romantic verses. Sheet music such as George Linley’s 'Grace Darling Ballad' entered the drawing rooms of those wealthy enough to own a piano. 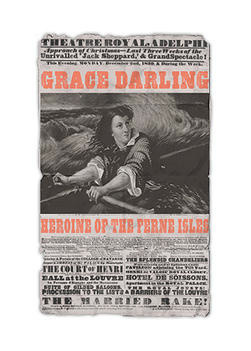 On the cover Grace is pictured in a flowing dress, stood upright in the boat, and battling a raging sea. In contrast to the ‘romance’ novels and their irrelevant characters, in the ballads Grace is the sole object of attention. From the lighthouse she hears the cries of the stranded out at sea and then has to encourage her father to launch a boat and attempt a rescue. This misleading version of events became the accepted storyline and was widely believed. Several cheap ballads were produced; some were amended and re-published many years later. 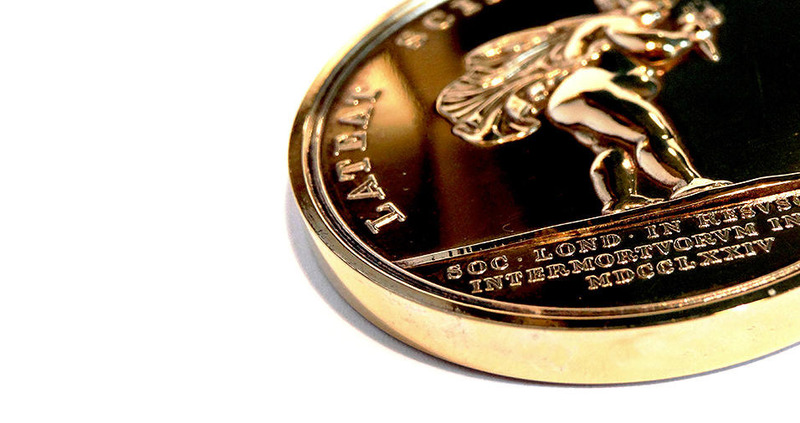 Collecting souvenirs was an obsession in Victorian times. In most homes shelves, tables and dressers were filled with dozens of unrelated objects and figures. 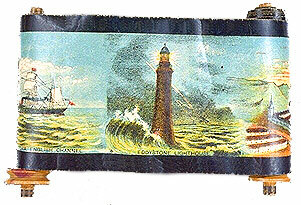 Manufacturers soon seized upon on the idea of producing Grace Darling memorabilia. She was tailor-made for it: a young, female English heroine. Then there was her name, admired for its euphonious sound; there was a famous date, 7 September 1838; and now her image had been captured by the artists and could be reproduced. Combining these elements was a marketing dream. 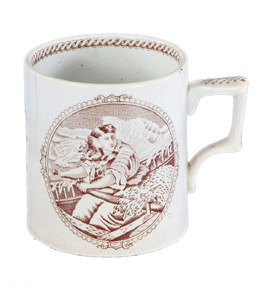 Grace Darling souvenirs were produced and sold in great numbers: postcards, china cups and jugs, glassware, model boats, cheap pottery figures. There would be a portrait of Grace, her name and sometimes the famous date recorded underneath, celebrating a special day in English history. Some souvenirs depicted scenes of the rescue, presenting Grace, with two oars, sat in a boat so tiny there was only room for her, but the message was loud and clear, she was a national heroine and people wanted to own an image of her and take it into their homes. The collecting of Grace Darling-related memorabilia increased after her early death and continued for many years after. Grace had offers of marriage from all quarters - from would-be suitors with an eye on the money she was accumulating, to men of rank, offering their titles if she would marry and become Lady Grace! But Grace would not leave the lighthouse. Its familiar walls offered the only protection she had from a demanding and intrusive world. She wanted to return to her previous, uncomplicated life, but she was proclaimed a heroine and her new-found celebrity would not allow this. The pressure began to take its toll on her. Grace was physically strong. From being a child she rowed between the Farne Islands with ease. She would have been a strong swimmer. The sea was as natural an environment to her as a meadow would be to a child of the land. Yet she was modest and retiring by nature. She never considered her actions that day should have been rewarded or celebrated. Her role as a national heroine sat awkwardly with her. Her only motive had been to save lives; sadly, the consequences of fame that followed, helped destroy her own.